What's a gal TO DO when her list of TO DO'S is too long? Escape! Tim and I spent some time wandering around an antique store, just for the fun of it. Spent a little over $10. The jewelry is vintage. 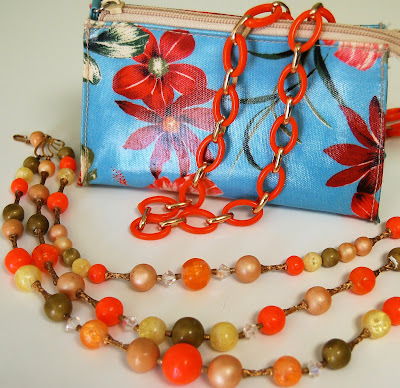 I kept the beaded necklace and gave the orange and gold chain to Jennifer. She squealed..same as a huge "thank you" in my book. I'm sure the little bag is new, but couldn't pass it up. So, that's what I got. AND this is what I did NOT get. Tim was almost disturbed by this. He couldn't get over it, so I suggested he use his new handy-dandy camera and snap a picture, so he could continue to critique it later. The picture isn't great, but I bet you get the idea. It's maybe a shrine to either Jesus or Florida, or both? The ceramic keg behind it was a separate lovely find. On to something much more pleasant for your viewing pleasure. Kristen from Gock's Frocks made some adorable skirts out of my Flights of Fancy...cute, huh? She did a great job mixing ribbons and fabrics together, didn't she? I don't think I've ever introduced you to my Tashi. On Thurs. we realized Tashi had been gnawing at himself and it was infected. Once I got in to the vet's, next thing I know we have a head cone, medicine, salve, and diapers to prevent the salve from spreading on furniture, carpet, etc. as Tashi is obsessive...he'll freak and try to remove anything he didn't put there himself. We had to nix the diaper, as he was SSOOOO freaked. So Nurse Paula has covered the sofa and made a sick bed for him to recover. We hand feed him, wipe his chin when he drinks and scritch his neck and anything he can't reach. I even slept on the sofa with the patient a couple nights. Tim took him out in the snow, which Tashi loves to dive into head first. He became a live doggie SNOW CONE. Poor guy is on the mend. 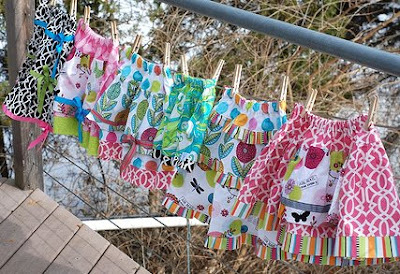 My third fabric collection is finally finished and off to the Powers That Be, er, Kathy. My second strike-offs should arrive in Kathy's hands today. Don't think I'm lounging on the sofa with Tashi. Got a few things up my sleeve. we find all kinds of treats hiding out there. The kids like to antique, but they love to look at grandmas stuff too. I will post some pictures on my blog later this week of her home! 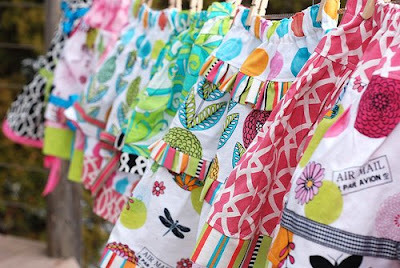 I love the skirts in your fabric! Beautiful. Hope your puppy gets better soon! The cone picture looks so pitiful. I love your antique shop find. I love vintage jewelry. The Gock's Frock's skirts are lovely... but I love everything that's made from Flights of Fancy. I hope your puppy feels better soon. Can't wait to see your new fabrics!! Those skirts are just yummy! Poor puppers! I bet that's tough on the 'ol self esteem. Can't wait to see your new line! 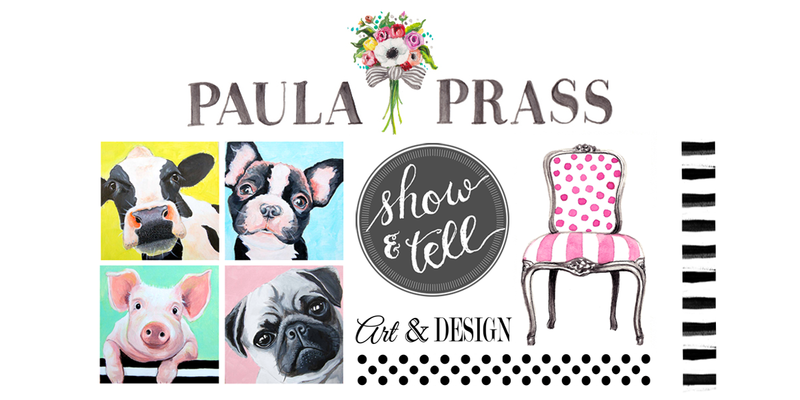 Hi Paula! I just wanted to thank you for leaving a comment on my blog. I also wanted to tell you that I actually wrote a little blog piece about you today, because I was talking about that fabric that my boyfriend had bought me. I hope that you're having a wonderful day! P.S. 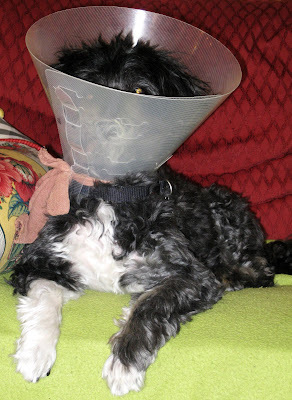 You dog, with the little cone around his head, is the cutest thing! Thanks for visiting my blog...I am really new to this type of thing. So I know that we have sweet Jen of the Cottage Nest in common, Liberty, my Wheaton Terrier wore a lampshade like your sweet pup did, and I love your fabric, which I am sure we have in common. What else do we have in common? I would love to find out. I loved this post. It made me dream (those incredibly cute & colorful skirts), question (an odd arrangment of doodads that pay homage to ??? ), and laugh out loud (snow cone). Couldn't have been better. Thanks for the smiles. What a delightful post! I'm sorry your Tim was so disturbed, that actually brought back fond memories for me of a nite lite my grandma used to keep on for me. 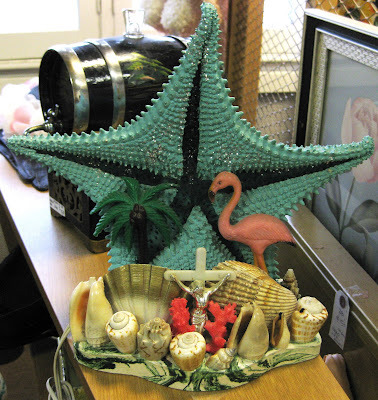 The base was some kind of greenish-gray shimmery shells, above that was a huge pink conch shell with the crucifix. Would have been in the 60's -- must have been a hot thing back then. And I'm so exicted -- yesterday I got a parcel of supplies to do display samples and guess what I got -- Flights of Fancy!!! In the pink and orange colorway. I am in heaven! 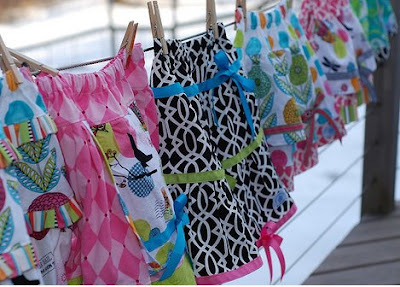 The project for that is was way too simple IMHO, but your fabric will make it!